U.S. 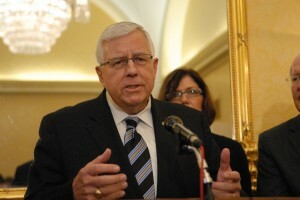 Senators Mike Enzi and John Barrasso, both R-Wyo., cosponsored legislation to ensure the wide-reaching Drought Contingency Plan (DCP) forged between the seven Colorado River Basin states and Indian tribes can be implemented without delay while fully respecting important environmental protections in the process. The legislation, led by U.S. Senator Martha McSally, R-Ariz., was cosponsored by all 14 senators from the Colorado River Basin. The Colorado River Basin drains more than 246,000 square miles across seven states and Mexico. More than 40 million people in Arizona, California, Colorado, Nevada, New Mexico, Utah and Wyoming depend on the river for drinking water, farming irrigation, and hydropower. Since 2000, the Colorado River has experienced its most severe drought in 100 years of record keeping and what may be the one of the driest periods in the last 1,200 years according to paleo-records. The DCP was negotiated between the seven Colorado River Basin States and Indian tribes to respond to this prolonged drought. It is designed to protect Lakes Mead and Powell from reaching certain critical water elevations that would trigger severe water supply reductions and hydropower impacts, including the risk of reaching crises levels where operational control of the Colorado River System is lost.